The small Portuguese village seemed to doze in the midday heat, the central road junction was deserted. Then a van drove by: ding-a-ling sounded the bell from the blue pick-up truck. A short time later men and women from several houses came out with shopping bags and wallets in hand. A spontaneous neighbourly meeting formed with Jorge Batista, the melon seller. "Come on," I was invited by my friend Fernanda, "his melons taste really delicious and are very cheap." I was sitting in front of a house in the shade of the awning and preferred to stay there to continue to paint my picture. 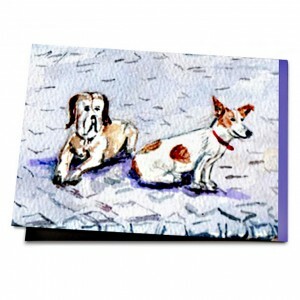 There was no more space for a pick-up truck on the paper, but only for Violetta and Ruby, two particularly endearing village dogs. They had made themselves comfortable on the intersection and looked at me expectantly. Of course, the two had to be in the painting. Ruby, already old and with tired limbs, was everyone’s favourite. In the morning he was expected by the butcher, who slipped him the end of sausage, at noon by Céleste with a plate of leftovers and in the afternoon by the village elders in the square, whom he kept company. Of an entirely different nature was Fernanda’s Violetta, who would do a tour of inspection several times a day. A clever, friendly dog, ​​who knew everyone and everything. So small and cramped, as a village may be, it came to my mind, in many ways, it also has depth and width. Where else, for example, do dogs move as freely and at ease? In a city, certainly not. So now Ruby and Violetta came to be part of my street scene image, I was pleased with myself and the world. "Here, that is for you!" Suddenly Fernanda stood at my side and gave me a large melon. "Wow, that looks good! Hmmm, if it tastes as good it smells..." Violetta had jumped up to me and Ruby slowly stood up on his legs. The purchases were made, the village news exchanged, the intersection emptied. Now Jorge Batista climbed behind the wheel and chugged back to his Campo with half a load. Time for the beach, I thought. Time for a nap, said Fernanda. Time for the next tour of inspection round the village, decided Ruby and Violetta - and they were back on the slopes.